Transfer the agent to the device you want to discover. The agent can be transferred to the host via any preferred method from file transfer to physical USB copying. There is no installation needed. The agent is a single executable. Run the agent in offline mode with the -offline switch and output name for the log. Next upload the agent log to Device42 using the Agent Log Upload utility . If you run the agent on multiple devices at once and collect the files, you can batch upload all at one time from a single collection point. 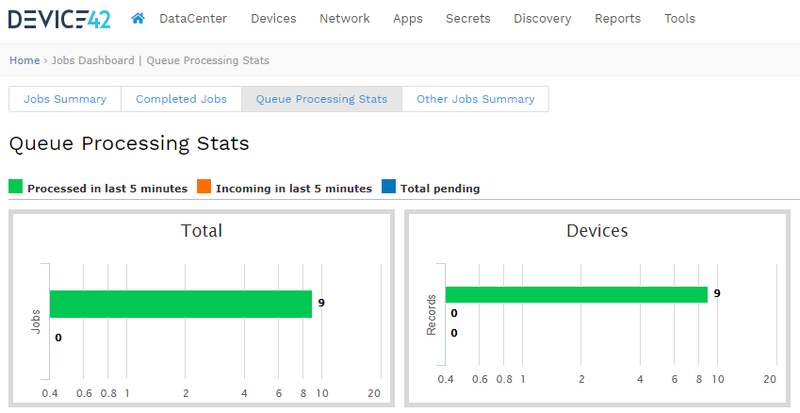 You can monitor the progress of the new devices processing into Device42 on the Queue Processing page on your Jobs Dashboard. When complete, all the devices uploaded and processed will be available in Device42, and you’ll be able to find them in all device lists and reports. Full documentation can be found on our docs site in the “Agent-based Offline Discovery” article. Give offline discovery a try today! Click to download Device42 — It’s not only FREE, but fully functional — for 30 days! Check out the full Agent based offline discovery documentation on the Device42 DOCS site. Download the Agent Log Upload Utility from our Utilities download page.